Today I have a quick -n- sweet little treat for you today! I’m showcasing our Acetate Boxes! These boxes are a quick -n- easy way to share a sweet little treat with a neighbor or loved one. Our first little box is found on page 195 of the Annual Catalog and is perfect to share a yummy treat with. 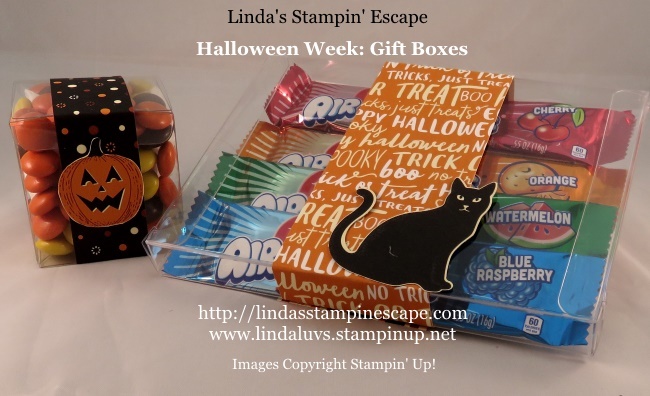 The belly band around the box is from the “Halloween Nights” Designer paper … even the cute little pumpkin was cut from another sheet/pattern of the designer paper. The larger acetate box can be found in the Holiday Catalog on page 13, and holds a little bit bigger type of treat! I’m sure that you can think of all types of goodies to put inside. Again the belly band is from the “Halloween Nights” Designer paper … and so is our cat. The cat is actually punched out with our new cat punch, also found in the Holiday Catalog on page 53. So if you’ve got some specials little ghouls or goblins that are expecting a Halloween treat … make them something special in just a wink of the eye! Here is a list of the supplies used in today’s projects. Just click on them for more information or to begin shopping. Thank You!